Apple has released the seventh beta version of macOS Sierra to users participating in the Mac developer beta testing program. The same build is also available to public beta release testers versioned as macOS Sierra public beta 6. Mac users running a prior version of macOS Sierra 10.12 can find the latest version available now from the software update mechanism of the Mac App Store. 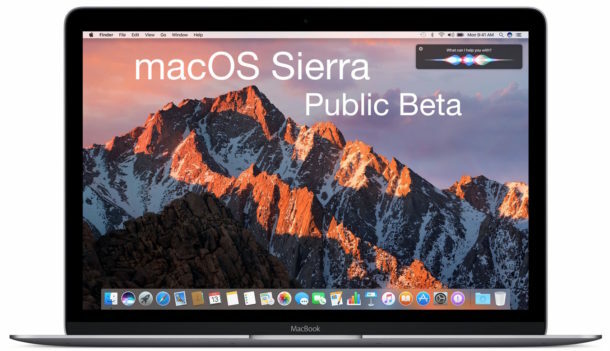 Anyone can choose to download and install macOS Sierra public beta but given the nature of beta system software, it is generally only recommended for more advanced users, and to test on a non-primary machine. Another option is to dual boot macOS Sierra with a stable Mac OS X release like El Capitan, but again, that is appropriate for advanced Mac users only. Apple usually releases beta updates concurrently but for this release they have been staggered. For the iPhone and iPad, iOS 10 beta 7 and public beta 6 was released last week. A new beta build for watchOS 3 and tvOS 10 have not yet been released. The final version of macOS Sierra will be available sometime this fall, though an exact release date is not yet known. apple doesn’t Know How to Use Casing and Capitalization now. It’s MacOS Sierra. Actually, it’s Mac OS Sierra. Or more likely, it’s Mac OS X Sierra. I hate the improper capitalization that Apple is using. Or is it apple now? macBook Pro? Who came up with this nAming and casing convention? Was it timCook? jonyIve? pHil sChiller? Rebranding for the sake of rebranding is a mistake. It is confusing, and nobody aside from the press is obeying it. I think it looks terrible. It makes sense with iOS, iPhone, iMac, etc, but as soon as it went to ‘watchOS’ rather than “Watch OS” I knew we were in for a new trend of badCasingPro. I agree. It’s pretty stupid. Been using OS X for some time now but I’m going back to Windows soon. All that “flash” is causing my Mac to crash was a bunch of you know what. Apple has its issues just like Microsoft does. Microsoft has a more users and is better for developers like me. Plus Windows manages memory better than OS X.
It’s true. And I’m not totally knocking OS X. There’s things I do like about it. As a developer and normal user. But it’s not perfect. Neither is Windows. I’m just no longer going to pay the price tag that Apple wants. At least they could focus on bugs more than what is going to be in the next release. It would also be nice to see Nvidia or ATI graphics over the generic Intel chips. Anyways, enough said. I’ll give Sierra a chance. If it fails the test, then I’ll move on (back) to Windows. I ain’t got time for this nonsense. But I’ll probably keep buying Apple hardware, just in case, and because it’s generally good stuff, especially the notebooks. Now M$ are saying they’ll support Skylake, it’s a safe bet at least until 2023 with Win8.1 (and Classic Shell, natch). I do concur on that Ed, but this is something that has crept in with more than one influence. The shear volume of Americanism spelling where grammar has never had the same importance in schooling. It has also been exacerbated by phone SMS and online chat. Yes, what was once a big issue has been bullied into what it now is. Irritating? Yes at times, but it is not just Apple, it is other factors beyond control now. It’s a common practice in programming where common root of the world for different names (functions etc) begin with a lowercase letter. Nice get Vesper. I’ve been CamelCasing graphic document titles-versions for years, ’cause I’m so bad with the numeric row of a keyboard, and underscores drive me nuts. Thanks for the commentary on capitalization…does anyone want to talk about the beta? I haven’t installed it but I am thinking about it. Thoughts on where I should install it on my personal Macbook pro? I would recommend waiting until Mac OS 10.12.1 if you want the most stable experience with Sierra. At the very least, wait until OS X Sierra 10.12 final is out for a few weeks so it can be tested on the masses of early adopters. That’s the true test stage, and 10.12.1 is the first patch that will be more stable. The beta versions are OK but underperform and have bugs in ways that many people would consider to be intrusive to their workflow. I would wait it out, or put it on a Mac that is not your primary work machine if you want to experience the bugs. The biggest new feature is Siri, but I find I don’t use it on the Mac, it is more useful on the iPhone in my experience. How do I determine which MacOS Sierra public beta version I have installed? I have had troubles installing recently.